Heat oven to 375°F. In 3-quart saucepan, mix stuffing, turkey and gravy. Cook over medium-high heat until hot, stirring constantly. Spoon into ungreased 13x9-inch (3-quart) glass baking dish. Unroll dough; cut dough crosswise into 4 rectangles (if using crescent rolls, press perforations to seal). 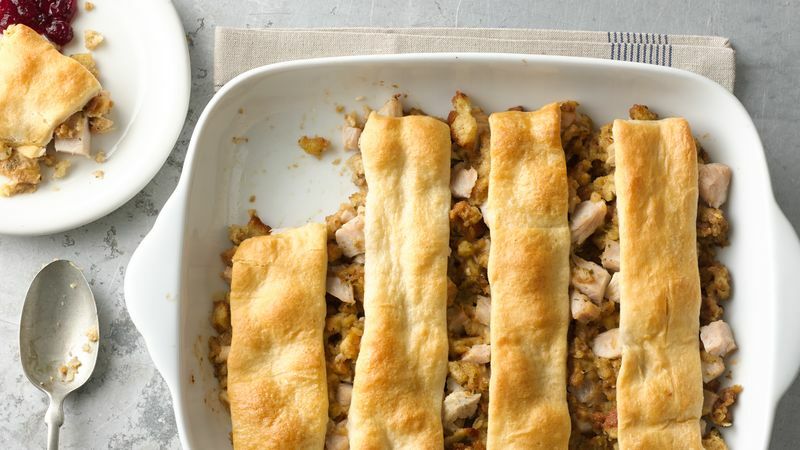 Place rectangles over stuffing, leaving space between rectangles for steam to escape. Bake 18 to 22 minutes or until crescents are golden brown. Serve topped with cranberry sauce. Don’t skip heating the stuffing, turkey and gravy together before putting it into the casserole. The hot mixture ensures that the crescent dough will be baked through. Purchase a jar of turkey gravy to have on hand just in case there’s none leftover.